As it becomes available, we will add workshop schedule information here. As it becomes available, we will add workshop speaker information here. As it becomes available, we will add exhibitor information here. Click here for an AACS Continuing Education Attendance Voucher. Scroll down for Exhibitor Information. If you are arriving on Wednesday for the conference and would like to attend church, Colonial Hills Baptist Church will be meeting at 7:00 p.m. Follow us on Facebook and Twitter (#glcec) too! You may be looking for dining options while in Kalamazoo. Discover Kalamazoo has given us a dining guide to post with area restaurants. All options listed in the yellow section of Page 1 are within 1 mile of the Radisson. Click here for the dining guide. ​Countywide options for dining can also be found on the Discover Kalamazoo website here. PASTOR’S and ADMINISTRATOR’S Breakfast: We would like to invite the pastors and administrators to join us for breakfast on Friday morning from 8:00 – 9:30 a.m. in Zazio’s Restaurant. Come out to hear Josh Hershberger from Bold Church Initiative as well as, John Bott from The WILDS. Cost is $15 and preregistration is required by September 30. Click here to sign up and pay for the breakfast. If you are arriving on Wednesday for the conference and would like an area church to attend, Faith Baptist Church in Mattawan, Michigan (15 minutes from the Radisson) has graciously extended an invitation to attend their mid-week services. Click here for information on their service. 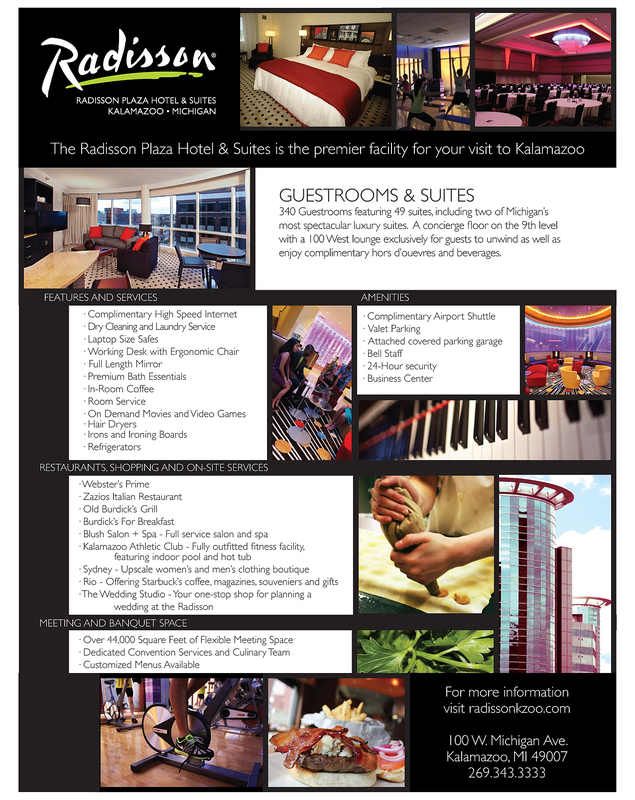 Thank you for making the Radisson Plaza Hotel your first choice. if you are looking to book a group of rooms, please click on the link below to see a list of other hotels that have made special rates available to us. Experience unparalleled comfort and relaxation in one of 340 hotel rooms at the Radisson Plaza at Kalamazoo Center. All of our spacious accommodations offer complimentary high-speed Internet access, flat-panel televisions, room service and upgraded linens and comforters. You can also enjoy upgraded amenities and a free express breakfast when you reserve a room on our Concierge Floor. Take I-94 to exit 74-B, Westnedge Ave. N.
Westnedge becomes a one-way street called Park St. The hotel is one block down on the NE corner of Rose St. and Michigan Ave. Parking: Self parking is available in the hotel ramp located on the NW corner of Rose St. and Michigan Ave. There is a skywalk from the ramp to the hotel on the third floor of the parking structure. The cost for self-parking for hotel guests is $5.00 per day ($10 per day if not staying at the hotel). Bus and large van parking is available nearby. Guests will want to contact Kalamazoo’s Central City Parking directly to make reservations by calling 269-342-6383. Cost is $20/day and payment is flexible (checks can be mailed ahead of time or payment can be made at the downtown office when you arrive.) Please note that overnight street parking is subject to ticketing, so guests staying at the Radisson will definitely want to be in the ramp or the bus lot (Lot 30) vs. finding street parking during their stay. Sign up to be at our conference now while space is still available! ​Click on the Exhibitor Registration Form button below to register now.